I guess I need to rethink on my prediction , what I made, on my previous post. In last ODI ,that was one of the fantastic chase I have ever seen. Most striking feature of that chase was the pace of the innings. It seems to be very plan innings of Pakistan. They started very cautiosly, kept wicket in hand, and in the end overs went for a kill. That was old classic chase. All credit goes to the Pakistani batsmen, especially Younis Kahn. ………I was hearing on the commentary, that Younis is no good in chasing big total (he is able to score at the brisk pace). But I guess he proved everybody wrong……..
Actually India also faced similar situation in the Nagpur one day against Australia, in the recently concluded series. Ganguly was doing all well, but the problem was he couldn’t pace his inning properly and at the end run rate was to high for our lower level batsmen.So, there is somtheing to learn from Younis innings. Well India responsible for its own loss. India was poised to score somewhere around 350-360. That would have been literally impossible target to chase. 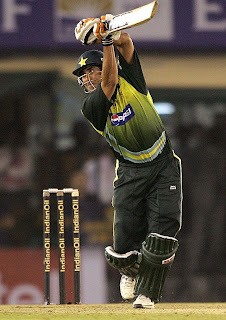 But the comeback spells from Umar Gul and Shoib broke the back of Indian middle order. 321 is also good enough total to defend on any kind of wicket. If the team is losing after posing such a big total then there is something serious to think about. Wicket was turning when harbhajan was bowling. If Murali Karthik could have played the game, then he could had major impact on the game. He bowled very well in the Guwahati game. Left arm spinner is always difficult to handle than right arm spinner. So , dropping Murali doesn’t make any sense. Well I think that ploy was adopted to give chance to Sehwag, who once again failed. India should understand that winning matches should be given the top priority. Chances can be given to players when the series is sealed. Now a days shuffling of batting order has become very regular. No one knows who is coming next. Why Dhoni is kept changing his position in batting order??? He should realise that he is more effective up the order than lower down the order. It is difficult even for Dhoni, to start hitting from the word go. He does take some time to settle down and after that he is very much capable of playing long innings. So why he is still playing down the order. He is capable of hitting centuries, then why he going there to make 30-40 runs? I don’t have any clue. Now , coming to test captaincy.It really hurts to see some one like Kumble, who is one of the finest and senior most player in the team has to wait so long to become captain. We were trying to convince Sachin who has miserable record as a test captain, and we are giving captainship to Kumble when we are out of choice…….pathetic. In my view Kumble has won more test matches than any other player in India. He should have given this honour long before. Making him captain when he is about to retire doesn’t make any sense. Well coming back to IND-PAK series. I guess India must have learnt some lessons from the last match. I guess they will be well prepared this time. India should remember what happen last time when Pakistan visited India, India won first 2 matches, then Pakistan went to win 4 matches ………..winning the series.